The organism is considered opportunistic insofar as serious infection often occurs during existing diseases or conditions – most notably cystic fibrosis and traumatic burns. It generally affects the immunocompromised but can also infect the immunocompetent as in hot tub folliculitis. Treatment of P. aeruginosa infections can be difficult due to its natural resistance to antibiotics. When more advanced antibiotic drug regimens are needed adverse effects may result. It is citrate, catalase, and oxidase positive. It is found in soil, water, skin flora, and most man-made environments throughout the world. It thrives not only in normal atmospheres, but also in low-oxygen atmospheres, thus has colonized many natural and artificial environments. It uses a wide range of organic material for food; in animals, its versatility enables the organism to infect damaged tissues or those with reduced immunity. The symptoms of such infections are generalized inflammation and sepsis. If such colonizations occur in critical body organs, such as the lungs, the urinary tract, and kidneys, the results can be fatal. Because it thrives on moist surfaces, this bacterium is also found on and in medical equipment, including catheters, causing cross-infections in hospitals and clinics. It is also able to decompose hydrocarbons and has been used to break down tarballs and oil from oil spills. P. aeruginosa is not extremely virulent in comparison with other major pathogenic bacterial species – for example Staphylococcus aureus and Streptococcus pyogenes – though P. aeruginosa is capable of extensive colonization, and can aggregate into enduring biofilms. The word Pseudomonas means "false unit", from the Greek pseudēs (Greek: ψευδής, false) and (Latin: monas, from Greek: μονάς, a single unit). The stem word mon was used early in the history of microbiology to refer to germs, e.g., kingdom Monera. 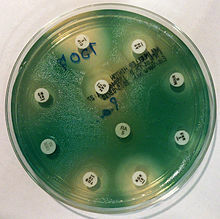 The species name aeruginosa is a Latin word meaning verdigris ("copper rust"), referring to the blue-green color of laboratory cultures of the species. This blue-green pigment is a combination of two metabolites of P. aeruginosa, pyocyanin (blue) and pyoverdine (green), which impart the blue-green characteristic color of cultures. Another assertion is that the word may be derived from the Greek prefix ae- meaning "old or aged", and the suffix ruginosa means wrinkled or bumpy. The names pyocyanin and pyoverdine are from the Greek, with pyo-, meaning "pus", cyanin, meaning "blue", and verdine, meaning "green". Pyoverdine in the absence of pyocyanin is a fluorescent-yellow color. The genome of P. aeruginosa consists of a relatively large circular chromosome (5.5–6.8 Mb) that carries between 5,500 and 6,000 open reading frames, and sometimes plasmids of various sizes depending on the strain; Comparison of 389 genomes from different P. aeruginosa strains showed that just 17.5% is shared. This part of the genome is the P. aeruginosa core genome. P. aeruginosa is a facultative anaerobe, as it is well adapted to proliferate in conditions of partial or total oxygen depletion. This organism can achieve anaerobic growth with nitrate or nitrite as a terminal electron acceptor. When oxygen, nitrate, and nitrite are absent, it is able to ferment arginine and pyruvate by substrate-level phosphorylation. Adaptation to microaerobic or anaerobic environments is essential for certain lifestyles of P. aeruginosa, for example, during lung infection in cystic fibrosis and primary ciliary dyskinesia, where thick layers of lung mucus and bacterially-produced alginate surrounding mucoid bacterial cells can limit the diffusion of oxygen. P. aeruginosa growth within the human body can be asymptomatic until the bacteria form a biofilm, which overwhelms the immune system. These biofilms are found in the lungs of people with cystic fibrosis and primary ciliary dyskinesia, and can prove fatal. P. aeruginosa relies on iron as a nutrient source to grow. However, iron is not easily accessible because it is not commonly found in the environment. Iron is usually found in a largely insoluble ferric form. Furthermore, excessively high levels of iron can be toxic to P. aeruginosa. To overcome this and regulate proper intake of iron, P. aeruginosa uses siderophores, which are secreted molecules that bind and transport iron. These iron-siderophore complexes, however, are not specific. The bacterium that produced the siderophores does not necessarily receive the direct benefit of iron intake. Rather, all members of the cellular population are equally likely to access the iron-siderophore complexes. Members of the cellular population that can efficiently produce these siderophores are commonly referred to as cooperators; members that produce little to no siderophores are often referred to as cheaters. Research has shown when cooperators and cheaters are grown together, cooperators have a decrease in fitness, while cheaters have an increase in fitness. The magnitude of change in fitness increases with increasing iron limitation. With an increase in fitness, the cheaters can outcompete the cooperators; this leads to an overall decrease in fitness of the group, due to lack of sufficient siderophore production. These observations suggest that having a mix of cooperators and cheaters can reduce the virulent nature of P. aeruginosa. An opportunistic, nosocomial pathogen of immunocompromised individuals, P. aeruginosa typically infects the airway, urinary tract, burns, and wounds, and also causes other blood infections. It is the most common cause of infections of burn injuries and of the outer ear (otitis externa), and is the most frequent colonizer of medical devices (e.g., catheters). Pseudomonas can be spread by equipment that gets contaminated and is not properly cleaned or on the hands of healthcare workers. Pseudomonas can, in rare circumstances, cause community-acquired pneumonias, as well as ventilator-associated pneumonias, being one of the most common agents isolated in several studies. Pyocyanin is a virulence factor of the bacteria and has been known to cause death in C. elegans by oxidative stress. However, salicylic acid can inhibit pyocyanin production. One in ten hospital-acquired infections is from Pseudomonas. Cystic fibrosis patients are also predisposed to P. aeruginosa infection of the lungs. P. aeruginosa may also be a common cause of "hot-tub rash" (dermatitis), caused by lack of proper, periodic attention to water quality. Since these bacteria like moist environments, such as hot tubs and swimming pools, they can cause skin rash or swimmer's ear. Pseudomonas is also a common cause of postoperative infection in radial keratotomy surgery patients. The organism is also associated with the skin lesion ecthyma gangrenosum. P. aeruginosa is frequently associated with osteomyelitis involving puncture wounds of the foot, believed to result from direct inoculation with P. aeruginosa via the foam padding found in tennis shoes, with diabetic patients at a higher risk. P. aeruginosa uses the virulence factor exotoxin A to inactivate eukaryotic elongation factor 2 via ADP-ribosylation in the host cell, much as the diphtheria toxin does. Without elongation factor 2, eukaryotic cells cannot synthesize proteins and necrotise. The release of intracellular contents induces an immunologic response in immunocompetent patients. In addition P. aeruginosa uses an exoenzyme, ExoU, which degrades the plasma membrane of eukaryotic cells, leading to lysis. Increasingly, it is becoming recognized that the iron-acquiring siderophore, pyoverdine, also functions as a toxin by removing iron from mitochondria, inflicting damage on this organelle. Phenazines are redox-active pigments produced by P. aeruginosa. These pigments are involved in quorum sensing, virulence, and iron acquisition. P. aeruginosa produces several pigments all produced by a biosynthetic pathway: pyocyanin, 1-hydroxyphenazine, phenazine-1-carboxamide, 5-methylphenazine-1-carboxylic acid betaine, and aeruginosin A. Two operons are involved in phenazine biosynthesis: phzA1B1C1D1E1F1G1 and phzA2B2C2D2E2F2G2. These operons convert a chorismic acid to the phenazines mentioned above. Three key genes, phzH, phzM, and phzS convert phenazine-1-carboxylic acid to the phenazines mentioned above. Though phenazine biosynthesis is well studied, questions remain as to the final structure of the brown phenazine pyomelanin. When pyocyanin biosynthesis is inhibited, a decrease in P. aeruginosa pathogenicity is observed in vitro. This suggests that pyocyanin is most responsible for the initial colonization of P. aeruginosa in vivo. With low phosphate levels, P. aeruginosa has been found to activate from benign symbiont to express lethal toxins inside the intestinal tract and severely damage or kill the host, which can be mitigated by providing excess phosphate instead of antibiotics. In higher plants, P. aeruginosa induces soft rot, for example in Arabidopsis thaliana (Thale cress) and Lactuca sativa (lettuce). It is also pathogenic to invertebrate animals, including the nematode Caenorhabditis elegans, the fruit fly Drosophila and the moth Galleria mellonella. The associations of virulence factors are the same for plant and animal infections. Regulation of gene expression can occur through cell-cell communication or quorum sensing (QS) via the production of small molecules called autoinducers. The extracellular accumulation of these molecules signals to bacteria to alter gene expression and coordinate behavior. P. aeruginosa employs five interconnected QS systems – lasRl, rhlRl, PQS, iqs and pch – that each produce unique signaling molecules. Detection of these molecules indicates P. aeruginosa is growing as biofilm within the lungs of cystic fibrosis patients. QS is known to control expression of a number of virulence factors, including the pigment pyocyanin. Another form of gene regulation that allows the bacteria to rapidly adapt to surrounding changes is through environmental signaling. Recent studies have discovered anaerobiosis can significantly impact the major regulatory circuit of QS. This important link between QS and anaerobiosis has a significant impact on production of virulence factors of this organism. Garlic experimentally blocks quorum sensing in P. aeruginosa. Polysaccharide synthesis locus (PSL) and c-di-GMP form a positive feedback loop. PSL stimulates c-di-GMP production, while high c-di-GMP turns on the operon and increases activity of the operon. This 15-gene operon is responsible for the cell-cell and cell-surface interactions required for cell communication. It is also responsible for the sequestering of the extracellular polymeric substance matrix. PEL is a cationic exopolysaccharide that cross-links extracellular DNA in the P. aeruginosa biofilm matrix. Upon certain cues or stresses, P. aeruginosa revert the biofilm program and detach. Recent studies have shown that the dispersed cells from P. aeruginosa biofilms have lower c-di-GMP levels and different physiologies from those of planktonic and biofilm cells. Such dispersed cells are found to be highly virulent against macrophages and C. elegans, but highly sensitive towards iron stress, as compared with planktonic cells. Biofilms of P. aeruginosa can cause chronic opportunistic infections, which are a serious problem for medical care in industrialized societies, especially for immunocompromised patients and the elderly. They often cannot be treated effectively with traditional antibiotic therapy. Biofilms seem to protect these bacteria from adverse environmental factors. P. aeruginosa can cause nosocomial infections and is considered a model organism for the study of antibiotic-resistant bacteria. Researchers consider it important to learn more about the molecular mechanisms that cause the switch from planktonic growth to a biofilm phenotype and about the role of QS in treatment-resistant bacteria such as P. aeruginosa. This should contribute to better clinical management of chronically infected patients, and should lead to the development of new drugs. Recently, scientists have been examining the possible genetic basis for P. aeruginosa resistance to antibiotics such as tobramycin. One locus identified as being an important genetic determinant of the resistance in this species is ndvB, which encodes periplasmic glucans that may interact with antibiotics and cause them to become sequestered into the periplasm. These results suggest a genetic basis exists behind bacterial antibiotic resistance, rather than the biofilm simply acting as a diffusion barrier to the antibiotic. Depending on the nature of infection, an appropriate specimen is collected and sent to a bacteriology laboratory for identification. 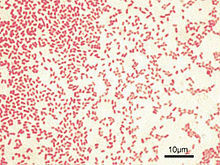 As with most bacteriological specimens, a Gram stain is performed, which may show Gram-negative rods and/or white blood cells. P. aeruginosa produces colonies with a characteristic "grape-like" or "fresh-tortilla" odor on bacteriological media. In mixed cultures, it can be isolated as clear colonies on MacConkey agar (as it does not ferment lactose) which will test positive for oxidase. Confirmatory tests include production of the blue-green pigment pyocyanin on cetrimide agar and growth at 42 °C. A TSI slant is often used to distinguish nonfermenting Pseudomonas species from enteric pathogens in faecal specimens. When P. aeruginosa is isolated from a normally sterile site (blood, bone, deep collections), it is generally considered dangerous, and almost always requires treatment. However, P. aeruginosa is frequently isolated from nonsterile sites (mouth swabs, sputum, etc. ), and, under these circumstances, it may represent colonization and not infection. The isolation of P. aeruginosa from nonsterile specimens should, therefore, be interpreted cautiously, and the advice of a microbiologist or infectious diseases physician/pharmacist should be sought prior to starting treatment. Often, no treatment is needed. P. aeruginosa is a Gram-negative, aerobic (and at times facultatively anaerobic), rod-shaped bacterium with unipolar motility. It has been identified as an opportunistic pathogen of both humans and plants. P. aeruginosa is the type species of the genus Pseudomonas. Identification of P. aeruginosa can be complicated by the fact individual isolates often lack motility. Furthermore, mutations in the gene lasR drastically alter colony morphology and typically lead to failure to hydrolyze gelatin or hemolyze. In certain conditions, P. aeruginosa can secrete a variety of pigments, including pyocyanin (blue), pyoverdine (yellow and fluorescent), pyorubin (red), and pyomelanin (brown). These can be used to identify the organism. Clinical identification of P. aeruginosa may include identifying the production of both pyocyanin and fluorescein, as well as its ability to grow at 42 °C. 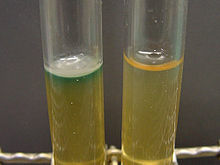 P. aeruginosa is capable of growth in diesel and jet fuels, where it is known as a hydrocarbon-using microorganism, causing microbial corrosion. It creates dark, gellish mats sometimes improperly called "algae" because of their appearance. Many P. aeruginosa isolates are resistant to a large range of antibiotics and may demonstrate additional resistance after unsuccessful treatment. It should usually be possible to guide treatment according to laboratory sensitivities, rather than choosing an antibiotic empirically. If antibiotics are started empirically, then every effort should be made to obtain cultures (before administering first dose of antibiotic), and the choice of antibiotic used should be reviewed when the culture results are available. antipseudomonal penicillins: carboxypenicillins (carbenicillin and ticarcillin), and ureidopenicillins (mezlocillin, azlocillin, and piperacillin). P. aeruginosa is intrinsically resistant to all other penicillins. As fluoroquinolones are one of the few antibiotic classes widely effective against P. aeruginosa, in some hospitals, their use is severely restricted to avoid the development of resistant strains. On the rare occasions where infection is superficial and limited (for example, ear infections or nail infections), topical gentamicin or colistin may be used. For pseudomonal wound infections, acetic acid with concentrations from 0.5% to 5% can be an effective bacteriostatic agent in eliminating the bacteria from the wound. Usually a sterile gauze soaked with acetic acid is placed on the wound after irrigation with normal saline. Dressing would be done once per day. Pseudomonas is usually eliminated in 90% of the cases after 10 to 14 days of treatment. One of the most worrisome characteristics of P. aeruginosa is its low antibiotic susceptibility, which is attributable to a concerted action of multidrug efflux pumps with chromosomally encoded antibiotic resistance genes (e.g., mexAB, mexXY, etc.) and the low permeability of the bacterial cellular envelopes. In addition to this intrinsic resistance, P. aeruginosa easily develops acquired resistance either by mutation in chromosomally encoded genes or by the horizontal gene transfer of antibiotic resistance determinants. Development of multidrug resistance by P. aeruginosa isolates requires several different genetic events, including acquisition of different mutations and/or horizontal transfer of antibiotic resistance genes. Hypermutation favours the selection of mutation-driven antibiotic resistance in P. aeruginosa strains producing chronic infections, whereas the clustering of several different antibiotic resistance genes in integrons favors the concerted acquisition of antibiotic resistance determinants. Some recent studies have shown phenotypic resistance associated to biofilm formation or to the emergence of small-colony variants may be important in the response of P. aeruginosa populations to antibiotics treatment. Mechanisms underlying antibiotic resistance have been found to include production of antibiotic-degrading or antibiotic-inactivating enzymes, outer membrane proteins to evict the antibiotics and mutations to change antibiotic targets. Presence of antibiotic-degrading enzymes such as extended-spectrum β-lactamases like PER-1, PER-2, VEB-1, AmpC cephalosporinases, carbapenemases like serine oxacillinases, metallo-b-lactamases, OXA-type carbapenemases, aminoglycoside-modifying enzymes, among others have been reported. P. aeruginosa can also modify the targets of antibiotic action, for example methylation of 16S rRNA to prevent aminoglycoside binding and modification of DNA, or topoisomerase to protect it from the action of quinolones. P. aeruginosa has also been reported to possess multidrug efflux pumps like AdeABC and AdeDE efflux systems that confer resistance against a number of antibiotic classes. An important factor found to be associated with antibiotic resistance is the decrease in the virulence capabilities of the resistant strain. Such findings have been reported in the case of rifampicin-resistant and colistin-resistant strains, in which decrease in infective ability, quorum sensing and motility have been documented. Mutations in DNA gyrase are commonly associated with antibiotic resistance in P. aeruginosa. These mutations, when combined with others, confer high resistance without hindering survival. Additionally, genes involved in cyclic-di-GMP signaling may contribute to resistance. When grown in vitro conditions designed to mimic a cystic fibrosis patient's lungs, these genes mutate repeatedly. Two small RNAs : Sr0161 and ErsA were shown to interact with mRNA encoding the major porin OprD responsible for the uptake of carbapenem antibiotics into the periplasm. The sRNAs bind to the 5'UTR of oprD causing increase in bacterial resistance to meropenem. Another sRNA: Sr006 was suggested to positively regulate (post-transcriptionally) the expression of PagL, an enzyme responsible for deacylation of lipid A. This reduces the pro-inflammatory property of lipid A. Furthermore, similarly to study in Salmonella Sr006 regulation of PagL expression was suggested to aid in polymyxin B resistance. Probiotic prophylaxis may prevent colonization and delay onset of Pseudomonas infection in an ICU setting. Immunoprophylaxis against Pseudomonas is being investigated. The risk of contracting P. aeruginosa can be reduced by avoiding pools, hot tubs, and other bodies of standing water; regularly disinfecting and/or replacing equipment that regularly encounters moisture (such as contact lens equipment and solutions); and washing one's hands often (which is protective against many other pathogens as well). However, even the best hygiene practices cannot totally protect an individual against P. aeruginosa, given how common P. aeruginosa is in the environment. Phage therapy against P. aeruginosa has been investigated as a possible effective treatment, which can be combined with antibiotics, has no contraindications and minimal adverse effects. Phages are produced as sterile liquid, suitable for intake, applications etc. Phage therapy against ear infections caused by P. aeruginosa was reported in the journal Clinical Otolaryngology in August 2009. Last 2013, João Xavier described an experiment in which P. aeruginosa, when subjected to repeated rounds of conditions in which it needed to swarm to acquire food, developed the ability to "hyperswarm" at speeds 25% faster than baseline organisms, by developing multiple flagella, whereas the baseline organism has a single flagellum. This result was notable in the field of experimental evolution in that it was highly repeatable. P. aeruginosa has been studied for use in bioremediation and use in processing polyethylene in municipal solid waste. Wikimedia Commons has media related to Pseudomonas aeruginosa. ^ Balcht A, Smith R (1994). Pseudomonas aeruginosa: Infections and Treatment. Informa Health Care. pp. 83–84. ISBN 978-0-8247-9210-7. ^ Itah A, Essien J (2005). "Growth Profile and Hydrocarbonoclastic Potential of Microorganisms Isolated from Tarballs in the Bight of Bonny, Nigeria". World Journal of Microbiology and Biotechnology. 21 (6–7): 1317–22. doi:10.1007/s11274-004-6694-z. ^ Høiby N, Ciofu O, Bjarnsholt T (November 2010). "Pseudomonas aeruginosa biofilms in cystic fibrosis". Future Microbiology. 5 (11): 1663–74. doi:10.2217/fmb.10.125. PMID 21133688. ^ Brown RW (1956). Composition of Scientific Words. Smithsonian Institutional Press. ISBN 978-0-87474-286-2. ^ Tzouchas A (2014). WestBow Press. Greek Words. p. 550. ISBN 978-1490726106. ^ Klockgether J, Cramer N, Wiehlmann L, Davenport CF, Tümmler B (2011). "Pseudomonas aeruginosa Genomic Structure and Diversity". Frontiers in Microbiology. 2: 150. doi:10.3389/fmicb.2011.00150. PMC 3139241. PMID 21808635. ^ De Smet J, Hendrix H, Blasdel BG, Danis-Wlodarczyk K, Lavigne R (September 2017). "Pseudomonas predators: understanding and exploiting phage-host interactions". Nature Reviews. Microbiology. 15 (9): 517–530. doi:10.1038/nrmicro.2017.61. PMID 28649138. ^ Schobert M, Jahn D (December 2010). "Anaerobic physiology of Pseudomonas aeruginosa in the cystic fibrosis lung". International Journal of Medical Microbiology. 300 (8): 549–56. doi:10.1016/j.ijmm.2010.08.007. PMID 20951638. ^ Gerard, Funke, Case (2016). Microbiology: An Introduction (12th ed.). Pearson Education. p. 54. ISBN 978-0-321-92915-0. ^ Hassett DJ (December 1996). "Anaerobic production of alginate by Pseudomonas aeruginosa: alginate restricts diffusion of oxygen". Journal of Bacteriology. 178 (24): 7322–5. doi:10.1128/jb.178.24.7322-7325.1996. PMC 178651. PMID 8955420. ^ Worlitzsch D, Tarran R, Ulrich M, Schwab U, Cekici A, Meyer KC, Birrer P, Bellon G, Berger J, Weiss T, Botzenhart K, Yankaskas JR, Randell S, Boucher RC, Döring G (February 2002). "Effects of reduced mucus oxygen concentration in airway Pseudomonas infections of cystic fibrosis patients". The Journal of Clinical Investigation. 109 (3): 317–25. doi:10.1172/JCI13870. PMC 150856. PMID 11827991. ^ Cooper M, Tavankar GR, Williams HD (May 2003). "Regulation of expression of the cyanide-insensitive terminal oxidase in Pseudomonas aeruginosa". Microbiology. 149 (Pt 5): 1275–84. doi:10.1099/mic.0.26017-0. PMID 12724389. ^ Williams HD, Zlosnik JE, Ryall B (2007). Oxygen, cyanide and energy generation in the cystic fibrosis pathogen Pseudomonas aeruginosa. Advances in Microbial Physiology. 52. pp. 1–71. doi:10.1016/S0065-2911(06)52001-6. ISBN 9780120277520. PMID 17027370. ^ Leach R, Moore K, Bell D (2016). Oxford Desk Reference: Acute Medicine. Oxford University Press. p. 244. ISBN 9780191007149. ^ Buckling A, Harrison F, Vos M, Brockhurst MA, Gardner A, West SA, Griffin A (November 2007). "Siderophore-mediated cooperation and virulence in Pseudomonas aeruginosa". FEMS Microbiology Ecology. 62 (2): 135–41. doi:10.1111/j.1574-6941.2007.00388.x. PMID 17919300. ^ Nguyen AT, Jones JW, Ruge MA, Kane MA, Oglesby-Sherrouse AG (July 2015). "Iron Depletion Enhances Production of Antimicrobials by Pseudomonas aeruginosa". Journal of Bacteriology. 197 (14): 2265–75. doi:10.1128/JB.00072-15. PMC 4524187. PMID 25917911. ^ a b Harrison F, Browning LE, Vos M, Buckling A (July 2006). "Cooperation and virulence in acute Pseudomonas aeruginosa infections". BMC Biology. 4: 21. doi:10.1186/1741-7007-4-21. PMC 1526758. PMID 16827933. ^ Griffin AS, West SA, Buckling A (August 2004). "Cooperation and competition in pathogenic bacteria". Nature. 430 (7003): 1024–7. doi:10.1038/nature02744. PMID 15329720. ^ Todar's Online Textbook of Bacteriology. Textbookofbacteriology.net (2004-06-04). Retrieved on 2011-10-09. ^ a b "Pseudomonas aeruginosa in Healthcare Settings". Healthcare-associated Infections (HAI): Diseases and Organisms. Centers for Disease Control and Prevention. 7 May 2014. ^ Fine MJ, Smith MA, Carson CA, Mutha SS, Sankey SS, Weissfeld LA, Kapoor WN (January 1996). "Prognosis and outcomes of patients with community-acquired pneumonia. A meta-analysis". JAMA. 275 (2): 134–41. doi:10.1001/jama.275.2.134. PMID 8531309. ^ Diekema DJ, Pfaller MA, Jones RN, Doern GV, Winokur PL, Gales AC, Sader HS, Kugler K, Beach M (September 1999). "Survey of bloodstream infections due to gram-negative bacilli: frequency of occurrence and antimicrobial susceptibility of isolates collected in the United States, Canada, and Latin America for the SENTRY Antimicrobial Surveillance Program, 1997". Clinical Infectious Diseases. 29 (3): 595–607. doi:10.1086/598640. PMID 10530454. ^ Prithiviraj B, Bais HP, Weir T, Suresh B, Najarro EH, Dayakar BV, Schweizer HP, Vivanco JM (September 2005). "Down regulation of virulence factors of Pseudomonas aeruginosa by salicylic acid attenuates its virulence on Arabidopsis thaliana and Caenorhabditis elegans". Infection and Immunity. 73 (9): 5319–28. doi:10.1128/IAI.73.9.5319-5328.2005. PMC 1231131. PMID 16113247. ^ Kirienko NV, Ausubel FM, Ruvkun G (February 2015). "Mitophagy confers resistance to siderophore-mediated killing by Pseudomonas aeruginosa". Proceedings of the National Academy of Sciences of the United States of America. 112 (6): 1821–6. doi:10.1073/pnas.1424954112. PMC 4330731. PMID 25624506. ^ Kirienko NV, Kirienko DR, Larkins-Ford J, Wählby C, Ruvkun G, Ausubel FM (April 2013). "Pseudomonas aeruginosa disrupts Caenorhabditis elegans iron homeostasis, causing a hypoxic response and death". Cell Host & Microbe. 13 (4): 406–16. doi:10.1016/j.chom.2013.03.003. PMC 3641844. PMID 23601103. ^ Dietrich LE, Price-Whelan A, Petersen A, Whiteley M, Newman DK (September 2006). "The phenazine pyocyanin is a terminal signalling factor in the quorum sensing network of Pseudomonas aeruginosa". Molecular Microbiology. 61 (5): 1308–21. doi:10.1111/j.1365-2958.2006.05306.x. PMID 16879411. ^ Abu EA, Su S, Sallans L, Boissy RE, Greatens A, Heineman WR, Hassett DJ (August 2013). "Cyclic voltammetric, fluorescence and biological analysis of purified aeruginosin A, a secreted red pigment of Pseudomonas aeruginosa PAO1". Microbiology. 159 (Pt 8): 1736–47. doi:10.1099/mic.0.065235-0. PMID 23782801. Mavrodi DV, Bonsall RF, Delaney SM, Soule MJ, Phillips G, Thomashow LS (November 2001). "Functional analysis of genes for biosynthesis of pyocyanin and phenazine-1-carboxamide from Pseudomonas aeruginosa PAO1". Journal of Bacteriology. 183 (21): 6454–65. doi:10.1128/JB.183.21.6454-6465.2001. PMC 100142. PMID 11591691. ^ a b Ho Sui SJ, Lo R, Fernandes AR, Caulfield MD, Lerman JA, Xie L, Bourne PE, Baillie DL, Brinkman FS (September 2012). "Raloxifene attenuates Pseudomonas aeruginosa pyocyanin production and virulence". International Journal of Antimicrobial Agents. 40 (3): 246–51. doi:10.1016/j.ijantimicag.2012.05.009. PMC 5511546. PMID 22819149. ^ "Research could lead to new non-antibiotic drugs to counter hospital infections" (Press release). University of Chicago Medical Center. 2009-04-14. Retrieved 2010-01-18. ^ Walker TS, Bais HP, Déziel E, Schweizer HP, Rahme LG, Fall R, Vivanco JM (January 2004). "Pseudomonas aeruginosa-plant root interactions. Pathogenicity, biofilm formation, and root exudation". Plant Physiology. 134 (1): 320–31. doi:10.1104/pp.103.027888. PMC 316311. PMID 14701912. ^ a b Rahme LG, Stevens EJ, Wolfort SF, Shao J, Tompkins RG, Ausubel FM (June 1995). "Common virulence factors for bacterial pathogenicity in plants and animals". Science. 268 (5219): 1899–902. doi:10.1126/science.7604262. PMID 7604262. ^ Rahme LG, Tan MW, Le L, Wong SM, Tompkins RG, Calderwood SB, Ausubel FM (November 1997). "Use of model plant hosts to identify Pseudomonas aeruginosa virulence factors". Proceedings of the National Academy of Sciences of the United States of America. 94 (24): 13245–50. doi:10.1073/pnas.94.24.13245. PMC 24294. PMID 9371831. ^ Mahajan-Miklos S, Tan MW, Rahme LG, Ausubel FM (January 1999). "Molecular mechanisms of bacterial virulence elucidated using a Pseudomonas aeruginosa-Caenorhabditis elegans pathogenesis model". Cell. 96 (1): 47–56. doi:10.1016/S0092-8674(00)80958-7. PMID 9989496. ^ Martínez C, Pons E, Prats G, León J (January 2004). "Salicylic acid regulates flowering time and links defence responses and reproductive development". The Plant Journal. 37 (2): 209–17. doi:10.1046/j.1365-313X.2003.01954.x. PMID 14690505. ^ D'Argenio DA, Gallagher LA, Berg CA, Manoil C (February 2001). "Drosophila as a model host for Pseudomonas aeruginosa infection". Journal of Bacteriology. 183 (4): 1466–71. doi:10.1128/JB.183.4.1466-1471.2001. PMC 95024. PMID 11157963. ^ Miyata S, Casey M, Frank DW, Ausubel FM, Drenkard E (May 2003). "Use of the Galleria mellonella caterpillar as a model host to study the role of the type III secretion system in Pseudomonas aeruginosa pathogenesis". Infection and Immunity. 71 (5): 2404–13. doi:10.1128/IAI.71.5.2404-2413.2003. PMC 153283. PMID 12704110. ^ Rahme LG, Ausubel FM, Cao H, Drenkard E, Goumnerov BC, Lau GW, Mahajan-Miklos S, Plotnikova J, Tan MW, Tsongalis J, Walendziewicz CL, Tompkins RG (August 2000). "Plants and animals share functionally common bacterial virulence factors". Proceedings of the National Academy of Sciences of the United States of America. 97 (16): 8815–21. doi:10.1073/pnas.97.16.8815. PMC 34017. PMID 10922040. ^ Allesen-Holm M, Barken KB, Yang L, Klausen M, Webb JS, Kjelleberg S, Molin S, Givskov M, Tolker-Nielsen T (February 2006). "A characterization of DNA release in Pseudomonas aeruginosa cultures and biofilms". Molecular Microbiology. 59 (4): 1114–28. doi:10.1111/j.1365-2958.2005.05008.x. PMID 16430688. ^ Winstanley C, Fothergill JL (January 2009). "The role of quorum sensing in chronic cystic fibrosis Pseudomonas aeruginosa infections". FEMS Microbiology Letters. 290 (1): 1–9. doi:10.1111/j.1574-6968.2008.01394.x. PMID 19016870. ^ a b c Cornelis P (2008). Pseudomonas: Genomics and Molecular Biology (1st ed.). Caister Academic Press. ISBN 978-1-904455-19-6. ^ Bjarnsholt T, Jensen PØ, Rasmussen TB, Christophersen L, Calum H, Hentzer M, Hougen HP, Rygaard J, Moser C, Eberl L, Høiby N, Givskov M (December 2005). "Garlic blocks quorum sensing and promotes rapid clearing of pulmonary Pseudomonas aeruginosa infections". Microbiology. 151 (Pt 12): 3873–80. doi:10.1099/mic.0.27955-0. PMID 16339933. ^ Laventie BJ, Sangermani M, Estermann F, Manfredi P, Planes R, Hug I, Jaeger T, Meunier E, Broz P, Jenal U (December 2018). "A Surface-Induced Asymmetric Program Promotes Tissue Colonization by Pseudomonas aeruginosa". Cell Host & Microbe. 25 (1): 140–152.e6. doi:10.1016/j.chom.2018.11.008. PMID 30581112. ^ Jennings L, et al. (September 2015). "Pel is a cationic exopolysaccharide that cross-links extracellular DNA in the Pseudomonas aeruginosa biofilm matrix". Proc Natl Acad Sci USA. 112 (36): 11353–11358. doi:10.1073/pnas.1503058112. PMC 4568648. PMID 26311845. ^ a b Chua SL, Liu Y, Yam JK, Chen Y, Vejborg RM, Tan BG, Kjelleberg S, Tolker-Nielsen T, Givskov M, Yang L (July 2014). "Dispersed cells represent a distinct stage in the transition from bacterial biofilm to planktonic lifestyles". Nature Communications. 5: 4462. doi:10.1038/ncomms5462. PMID 25042103. ^ Chua SL, Hultqvist LD, Yuan M, Rybtke M, Nielsen TE, Givskov M, Tolker-Nielsen T, Yang L (August 2015). "In vitro and in vivo generation and characterization of Pseudomonas aeruginosa biofilm-dispersed cells via c-di-GMP manipulation". Nature Protocols. 10 (8): 1165–80. doi:10.1038/nprot.2015.067. PMID 26158442. ^ Mah TF, Pitts B, Pellock B, Walker GC, Stewart PS, O'Toole GA (November 2003). "A genetic basis for Pseudomonas aeruginosa biofilm antibiotic resistance". Nature. 426 (6964): 306–10. doi:10.1038/nature02122. PMID 14628055. ^ Shovarani, Debanada (2008). "Isolation and Characterization of Pseudomonas Aeruginosa Strain DN1 Degrading p-Nitrophenol". Research Journal of Microbiology: 345–351. ^ Ryan KJ, Ray CG, eds. (2004). Sherris Medical Microbiology (4th ed.). McGraw Hill. ISBN 978-0-8385-8529-0. ^ Iglewski BH (1996). "Pseudomonas". In Baron S, et al. (eds.). Baron's Medical Microbiology (4th ed.). University of Texas Medical Branch. ISBN 978-0-9631172-1-2. ^ Anzai Y, Kim H, Park JY, Wakabayashi H, Oyaizu H (July 2000). "Phylogenetic affiliation of the pseudomonads based on 16S rRNA sequence". International Journal of Systematic and Evolutionary Microbiology. 50 Pt 4 (4): 1563–89. doi:10.1099/00207713-50-4-1563. PMID 10939664. ^ King EO, Ward MK, Raney DE (August 1954). "Two simple media for the demonstration of pyocyanin and fluorescin". The Journal of Laboratory and Clinical Medicine. 44 (2): 301–7. PMID 13184240. ^ Striebich RC, Smart CE, Gunasekera TS, Mueller SS, Strobel EM, McNichols BW, Ruiz ON (September 2014). "Characterization of the F-76 diesel and Jet-A aviation fuel hydrocarbon degradation profiles of Pseudomonas aeruginosa and Marinobacter hydrocarbonoclasticus". International Biodeterioration & Biodegradation. 93: 33–43. doi:10.1016/j.ibiod.2014.04.024. ^ Hachem RY, Chemaly RF, Ahmar CA, Jiang Y, Boktour MR, Rjaili GA, Bodey GP, Raad II (June 2007). "Colistin is effective in treatment of infections caused by multidrug-resistant Pseudomonas aeruginosa in cancer patients". Antimicrobial Agents and Chemotherapy. 51 (6): 1905–11. doi:10.1128/AAC.01015-06. PMC 1891378. PMID 17387153. ^ Nagoba BS, Selkar SP, Wadher BJ, Gandhi RC (December 2013). "Acetic acid treatment of pseudomonal wound infections--a review". Journal of Infection and Public Health. 6 (6): 410–5. doi:10.1016/j.jiph.2013.05.005. PMID 23999348. ^ Poole K (January 2004). "Efflux-mediated multiresistance in Gram-negative bacteria". Clinical Microbiology and Infection. 10 (1): 12–26. doi:10.1111/j.1469-0691.2004.00763.x. PMID 14706082. ^ Wong A, Rodrigue N, Kassen R (September 2012). "Genomics of adaptation during experimental evolution of the opportunistic pathogen Pseudomonas aeruginosa". PLoS Genetics. 8 (9): e1002928. doi:10.1371/journal.pgen.1002928. PMC 3441735. PMID 23028345. ^ a b Zhang YF, Han K, Chandler CE, Tjaden B, Ernst RK, Lory S (December 2017). "Probing the sRNA regulatory landscape of P. aeruginosa: post-transcriptional control of determinants of pathogenicity and antibiotic susceptibility". Molecular Microbiology. 106 (6): 919–937. doi:10.1111/mmi.13857. PMC 5738928. PMID 28976035. ^ Kawasaki K, China K, Nishijima M (July 2007). "Release of the lipopolysaccharide deacylase PagL from latency compensates for a lack of lipopolysaccharide aminoarabinose modification-dependent resistance to the antimicrobial peptide polymyxin B in Salmonella enterica". Journal of Bacteriology. 189 (13): 4911–9. doi:10.1128/JB.00451-07. PMC 1913436. PMID 17483225. ^ Forestier C, Guelon D, Cluytens V, Gillart T, Sirot J, De Champs C (2008). "Oral probiotic and prevention of Pseudomonas aeruginosa infections: a randomized, double-blind, placebo-controlled pilot study in intensive care unit patients". Critical Care. 12 (3): R69. doi:10.1186/cc6907. PMC 2481460. PMID 18489775. ^ Döring G, Pier GB (February 2008). "Vaccines and immunotherapy against Pseudomonas aeruginosa". Vaccine. 26 (8): 1011–24. doi:10.1016/j.vaccine.2007.12.007. PMID 18242792. ^ Sulakvelidze A, Alavidze Z, Morris JG (March 2001). "Bacteriophage therapy". Antimicrobial Agents and Chemotherapy. 45 (3): 649–59. doi:10.1128/AAC.45.3.649-659.2001. PMC 90351. PMID 11181338. ^ Wright A, Hawkins CH, Anggård EE, Harper DR (August 2009). "A controlled clinical trial of a therapeutic bacteriophage preparation in chronic otitis due to antibiotic-resistant Pseudomonas aeruginosa; a preliminary report of efficacy". Clinical Otolaryngology. 34 (4): 349–57. doi:10.1111/j.1749-4486.2009.01973.x. PMID 19673983. ^ van Ditmarsch D, Boyle KE, Sakhtah H, Oyler JE, Nadell CD, Déziel É, Dietrich LE, Xavier JB (August 2013). "Convergent evolution of hyperswarming leads to impaired biofilm formation in pathogenic bacteria". Cell Reports. 4 (4): 697–708. doi:10.1016/j.celrep.2013.07.026. PMC 3770465. PMID 23954787. ^ Zimmer C. "Watching Bacteria Evolve, With Predictable Results". Retrieved 2 February 2016. ^ Pathak, Vinay Mohan (23 March 2017). "Review on the current status of polymer degradation: a microbial approach". Bioresources and Bioprocessing. 4: 15. doi:10.1186/s40643-017-0145-9. ISSN 2197-4365. Breidenstein EB, de la Fuente-Núñez C, Hancock RE (August 2011). "Pseudomonas aeruginosa: all roads lead to resistance". Trends in Microbiology. 19 (8): 419–26. doi:10.1016/j.tim.2011.04.005. PMID 21664819.